The Pyle PWMAB250 Amplified Speaker System gives you easy access to your music. This 300 Watt Bluetooth system allows you to instantly stream wireless music from any Bluetooth device (like iPhones, Androids, iPad, Tablets, PCs, etc.) Grab the handheld microphone and start some karaoke action. System includes remote control & handheld microphone with 10 foot cable so you can sing, talk or give instructions comfortably. 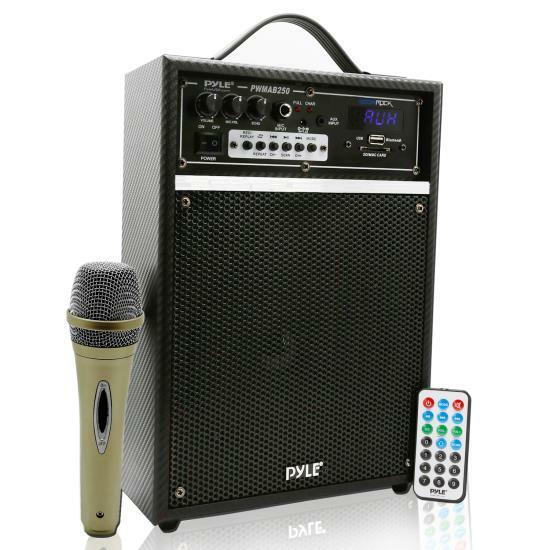 Built-in rechargeable battery make this PA system convenient, portable and perfect for parties and public gatherings. Turn up the fun with Pyle's PWMAB250 Bluetooth Speaker System. Can I add a wireless mike to this unit? If so, which one? Bluetooth?